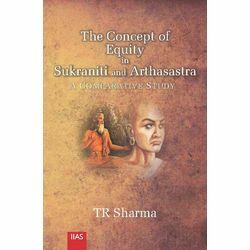 Seeking to break a new methodological ground the book conjures up, incomparative perspective, the concept of equity in Sukra and Kautilya not so much on the basis of analysis of their respective major works; Sukraniti of the former and Arthasatra of the later, but more so by examining their lives, the context in which they operated and the challenges that they faced. In this sense the present study is more extra-textual than textual. The reliance on extra-textual sources seems both appropriate and compelling because there is a near unanimity among the scholars that the extant Sukraniti text is not only corrupt but highly spurious. There is a similar controversy, though less acrimonious, about the authenticity of the Arthasastra text; even the authorship and dates of these works are contested. All these are issues, that scholars fully know, can never be settled satisfactorily. Therefore, rather than pursuing such false trails and thereby shying away from finding ways to discern the nature of their political concerns, the central focus of the present study is to examine their role as mentors and strategists in the major power struggles of their times; the stellar role of Sukra in the wars between the Aryans and the non-Aryans, particularly the one between Yayati and Varishparva at one time and between Visnu-Indra axis and Bali at the other; and the role of Kautilya in the intense no-holds-barred struggle for the throne of Magadha between the Nandas and the Mauryas and to cull out there-from their respective positions on critical issues like equity and social justice. The specific focus of this study is on the class character of these struggles, the positions that the two took, and the cause which each of them cherished, fought for and successfully accomplished.